Feeders are the lifeline of the ITER magnet system, relaying electrical power, cryogens, and instrumentation from outside of the cryostat into the powerful coils. Of the 31 feeders distributed all around the vessel, six will service the poloidal field coils. Each poloidal coil feeder consists of three principal units: the in-cryostat feeder, the cryostat feed-through and the coil terminal box which provides the housing for the connections of the magnets to other interfacing systems. 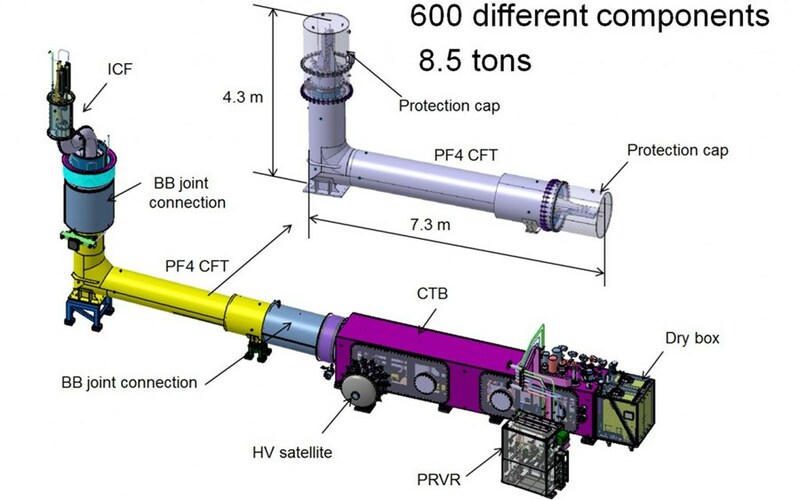 The cryostat feed-through for poloidal field coil #4 (pictured in left, in yellow, and enlarged at right) is part of a larger assembly that includes the in-cryostat feeder (ICF) and the coil terminal box (CTB). The 31 feeders of the ITER magnet system are vital components that are made up of some 600 smaller elements. 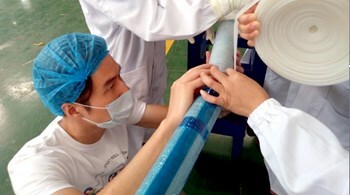 Since the signature of the magnet feeder Procurement Arrangement in 2011, the Chinese Domestic Agency and its supplier ASIPP (Chinese Institute of Plasma Physics) have been progressing through the qualification phase, fabricating mockups as well as full-scale prototypes for the most critical feeder components. 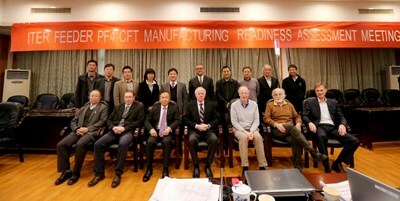 At the end of the qualification phase, a manufacturing readiness assessment is planned to assess the supplier's readiness to proceed to manufacturing for each component type. In early November, the first manufacturing readiness assessment took place for the cryostat feed-through for poloidal field coil #4 (PF4 Feeder CFT). ''A lot of effort has gone into developing detailed manufacturing and quality assessment/quality control plans and documentation, and this effort has paid off,'' says Arnaud Devred, head of the ITER Superconductor Systems & Auxiliaries Section. The event was celebrated as an important procurement milestone, as it follows five years of intense work to complete the design and carry out the qualification of key components and key manufacturing processes. In addition, this particular component—the cryostat feed-through for poloidal field coil #4—is the first magnet component needed on site because it needs to be brought into position before the completion of the cryostat base support ring. The component is scheduled for arrival during the third quarter of 2017. The review panel, made up of experts from the ITER Organization, the Chinese and European Domestic Agencies, and external specialists, was chaired by Rem Haange, former head of the ITER Project Department and acting ITER Chief Operating Officer through 23 October. Haange had been the Chair of the feeder Final Design Review as an external expert before joining the ITER Organization in January 2011. The review panel, made up of experts from the ITER Organization, the Chinese and European Domestic Agencies, and external specialists, was chaired by Rem Haange, former head of the ITER Project Department and acting ITER Chief Operating Officer through 23 October. Arnaud Devred, head of the ITER Superconductor Systems & Auxiliaries Section, summed up the results of the assessment: "This has been a very good example of active collaboration between the ITER Organization, the Chinese Domestic Agency, and supplier ASIPP. A very close relationship was needed in order to develop and validate the key technologies for this component (including the high voltage insulation of superconducting busbars, superconducting joints, cold mass supports, and the thermalization of cold mass). A lot of effort has gone into developing detailed manufacturing and quality assessment/quality control plans and documentation, and this effort has paid off." The committee confirmed the quality of the manufacturing arrangements it observed, in conformity with the requirements of the Procurement Arrangement.